February 16, 2016, 12:33 PM · In an effort to promote the coverage of live violin performance, Violinist.com each week presents links to reviews of notable concerts and recitals around the world. Joshua Bell performed Bernstein's "West Side Story" Suite with the Baltimore Symphony Orchestra for the orchestra's 100th Anniversary Concert. Baltimore Sun: "Arranger William David Brohn manages to honor the indelible music from the path-breaking Broadway show, while giving the violin equal opportunities for sensitivity and bravura. Bell revealed both attributes in abundance, backed with great finesse by the BSO under Alsop's expressive guidance." Washington Post: "The suite from Bernstein’s “West Side Story” for solo violin and orchestra...turned out to be a wholly engaging vehicle for Joshua Bell, showcasing his lyrical and expressive gifts as it leapt from song to familiar song, piling up motifs almost willy-nilly and casting him in one different role after another, keeping him on his toes. I am not sure I’ve ever enjoyed Bell more, occasional slips and all." 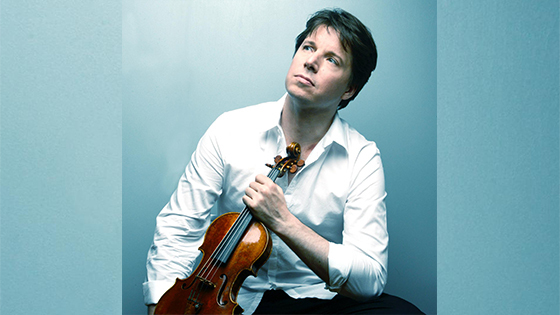 Joshua Bell. Photo by Phil Knott. Maxim Vengerov performed "The Butterfly Lovers" concerto with the New York Philharmonic. The New York Times: "The violinist Maxim Vengerov gave an idiomatic reading of the solo part in 'The Butterfly Lovers,' a violin concerto written in 1959 by Chen Gang and He Zhanhao. The work deftly maps the sounds of traditional Chinese music onto a Western orchestra, and Mr. Vengerov perfectly imitated the sound of an erhu (the Chinese violin), with silky glissandos, and evoked the extravagant vocal swoops of Chinese opera with graceful portamentos." William Hagen performed Bruch's Violin Concerto No. 1 with the Jacksonville Symphony. The Florida Times-Union: "Hagen’s beautiful tone captures the heartbreaking themes that are woven delicately within the soulfully played orchestral accompaniment....The audience flew to its feet at the concerto’s conclusion and at the playing of Hagen’s encore, Bach’s 'Prelude in E Major.'" Francesca Dego performed Paganini’s Violin Concerto No. 1 with the Fresno Philharmonic. Fresno Beehive: "Listening to the Italian-American violinist Francesca Dego play Paganini’s Violin Concerto No. 1 was like watching a famed acrobat at the top of her game: It was as if she did the whole thing without a net. Yet her playing is so smooth and supple, as she makes some of the world’s most pyrotechnic-style violin moves with grace and ease, that you can even forget the difficulty factor." Alina Ibragimova performed the Beethoven with the Madison Symphony Orchestra. The Capital Times: "Alina Ibragimova, soloist, was brilliant. She is both expressively and technically nimble, and she owned the material, prodding and pulling on the tempo, balancing the decorum of the classical era with ease and play." Julian Rachlin performed Mozart Violin Concerto No. 3 with the Naples Philharmonic. Naples Daily News: "He played with gusto, popping Mozart's allegro themes with explosive openers and cleanly articulating its tricky runs." DC Metro Theater Arts: "His solos in the Violin Concerto in D Major, opus 35 by Piotr Llyich Tchaikovsky in the end set of the Strathmore’s Gala Celebration were ferocious and raw, while sweepingly lithe and fleeting. The end of Finale: Allegro vivacissimo in particular brought the audience jumping to its feet and kept it there for 10 minutes applauding, all trying to hear this musical prodigy perform one more piece."